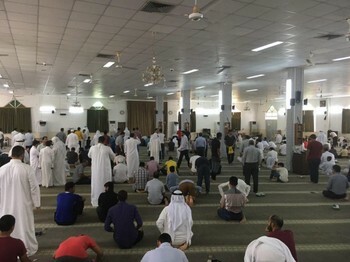 Manama - The Bahraini security authorities continued to ban the largest Shiite Friday prayer after preventing the Imam of prayers and worshipers from entering Diraz to reach the Imam Al-Sadiq mosque. The authorities have been besieging Diraz since over 100 days based on the open sit-in held outside the house of spiritual leader Ayatollah Sheikh Isa Qassim, who was revoked of his citizenship within a series of measures taken by the authorities against the Shia and opposition. The authorities intensified their campaign in the last months against the Shia majority and opposition. This campaign is considered to be the harshest against the opposition since the Saudi and Emirati forces entered to crushed protests demanding democracy in the Lualua roundabout. The Bahraini security authorities continued to ban the largest Shiite Friday prayer after preventing the Imam of prayers and worshipers from entering Diraz to reach the Imam Al-Sadiq mosque.